For years, we've seen iPhone killers come and go, then iPad killers. Now, the target is the iPad Mini. Never mind that the iPad Mini was late to the game for small tablets -- Samsung has had seven-inch tablets for years, and Google's Nexus 7 popularized the mini tablet last spring. The Note 8.0 comes on the heels of Samsung's ascendancy in the world of Android tablets, with its well-designed Galaxy Note 10.1 supplanting its own Galaxy Tab 10. What makes the Note series special is its included stylus, for pen-based operations. The Note 8.0n is the first mini tablet to have this capability. The theoretical benefits of the stylusTheoretically, the addition of the stylus should make the Galaxy Note 8.0 very appealing to business users, to overcome the small onscreen keyboard of a mini tablet. Although the iPad Mini and other mini tablets have become very popular on living room couches as entertainment devices, physicians also love them because they are easy to carry and fit in a lab coat. Other mobile professionals are also warming up to the iPad Mini, which provides full app compatibility with the standard-size iPad. But the iPad Mini's user interface is a bit scrunched, and reading its screens can be difficult, even if you use (as I do) its Accessibility settings to increase the text size. Although the smaller onscreen keyboard is serviceable, I get the appeal of a pen for checkoff-style input, as well as for drawing. But I never found any reason to pick up the Note 8.0's stylus. The reason: So few apps use it. The included S Note app shows how useful a pen can be to take notes, make annotations, and so on. If pen support becomes common in Android apps, I would expect the Galaxy Note 8.0 to gain popularity; it would make a lot of sense for medical, logistical, sales, and other mobile pros to have pen-based apps in the easily portable form of the Note 8.0. Until that day, the pen remains more potential than real benefit. The Note 8.0's big here-and-now advantageThere's a good reason to give the Note 8.0 serious consideration: its readability. Samsung has optimized the user interface so that text appears large, such as in the home screens and in apps like S-Planner (Samsung's Calendar replacement) and Email apps. By contrast, the iPad Mini's screen is a hard read -- reading glasses are recommended. Beyond that one advantage, the Note 8.0 falls behind the iPad Mini in many key areas, especially for use as a media tablet. A big part of that is the lack of iTunes and related AirPlay support -- Apple's iPad Mini is part of an established media ecosystem that works well together, while the Android world remains fragmented for video-out, screen sharing, content streaming, and media content. Samsung, like Google, is trying to create its own media ecosystem, but that has created confusion in devices like the Galaxy Note 8.0 and Galaxy S 4, where Samsung and Google offer competing services. Meanwhile, Apple's ecosystem just works, with the Apple TV supporting any HDMI-equipped TV or receiver. Plus, the iPad Mini supports many of Amazon's and Google's content services, so you're not stuck in an Apple universe. By contrast, Samsung's products steer you to Samsung's offerings, and Google's Nexus line steers to Google's offerings -- limiting their appeal. The Galaxy Note 8.0 does come with an infrared port to let it control a TV or receiver, but I had difficulty getting the WatchOn remote-control app to recognize my equipment -- the HTC One smartphone's equivalent TV app had no difficulty with this task. Of course, an iPad Mini can't serve as an IR remote, but at least that avoids the frustrations of it not working as expected. The iPad Mini is a better piece of hardware. Although the Galaxy Note 8.0's screen is nice, its speakers are poor, with a tinny, flat sound as bad as the Nexus 7's or Kindle HD's. You will not want to listen to music or a movie without headphones when using the Note 8.0. With an 11-pin, MHL-compliant MicroUSB-to-HDMI cable, you can connect the Note 8.0 directly to a TV or receiver, to use its better audio output -- but you can do the same with an iPad Mini's Lightning-to-HDMI cable. The Galaxy Note 8.0 costs $400 for a Wi-Fi-only version; no cellular models are available. Onboard storage is a paltry 16GB, but you can insert a MicroSD card with as much as 32GB capacity to boost the storage space for music, videos, and documents. Note that apps cannot be installed on a MicroSD card. Ironically, although media usage seems to be the mainstay of mini tablets, the Note 8.0's strength is as a business tablet. The iPad Mini works very well as a business tablet, but if more pen-savvy apps were available, the Galaxy Note 8.0 could give the iPad Mini a real run for its money. 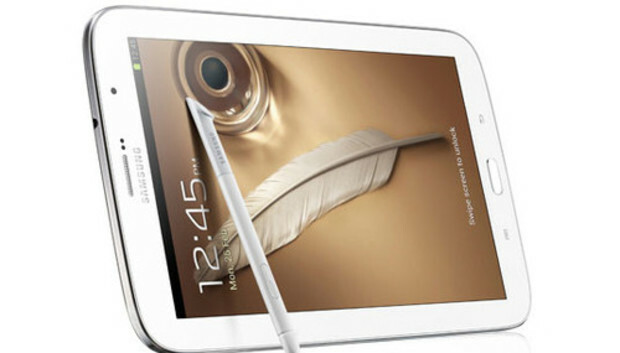 This article, "Review: Samsung Galaxy Note 8.0 scores one against the iPad Mini," was originally published at InfoWorld.com. Follow the latest developments in mobile computing, read Galen Gruman's Mobile Edge blog at InfoWorld.com, follow Galen's mobile musings on Twitter, and follow InfoWorld on Twitter.